There's something about pirouette cookies that I can't get enough of. I don't know if it's the ribbon of chocolate that slinks down the wafer or the fact that they're really tasty--delicate and flaky with a sweet cream filling. Whatever it is, I do enjoy creating a fence of pirouette cookies around my layer cakes for a fancier look, especially when the flavors of the cream filling complement the flavors of the cake. 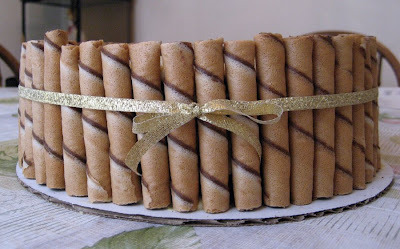 This weekend, my assistant and I churned out two birthday cakes--pirouettes aplenty. First, Joshua ordered a cake to surprise his wife with at her birthday party. 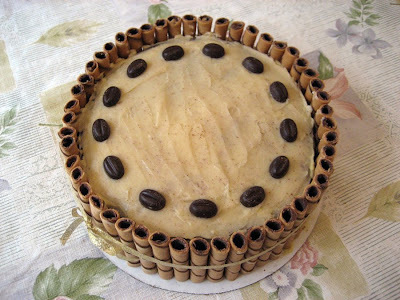 He requested a mocha cake with Bailey's filling and frosting. Presenting, the Mocha Madness, which is sure to energize and wake you up rather than lull you into sleep like my Midnight Mocha (which has Jack Daniels whiskey rather than coffee in the batter) might. 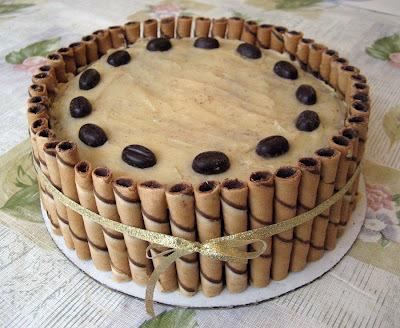 This is a two-layer mocha cake--a chocolate cake base with very strong, freshly-brewed coffee poured into the batter--filled with Bailey's custard, topped with Bailey's buttercream frosting, garnished with dark chocolate-covered espresso beans, and encircled by sturdy chocolate cream pirouette cookies. Held together by a shimmery gold ribbon, this cake contains layer after layer of flavor--rich dark chocolate with bold notes of coffee and the smooth creamy finish of Bailey's Irish Cream. Thanks for ordering, Joshua! Wishing your wife a very happy birthday. I hope you and your guests enjoyed the cake! Here we have a bottom layer of vanilla cake slathered with Bailey's custard and a generous filling of fresh strawberry slices. 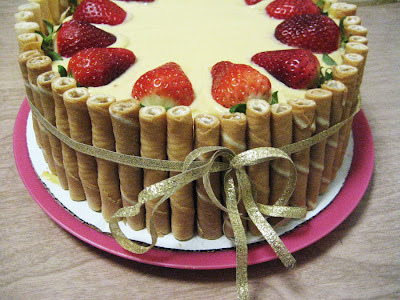 A second cake layer, gently placed on top of the first, is frosted with a smooth layer of Bailey's custard and neatly arranged strawberry halves. 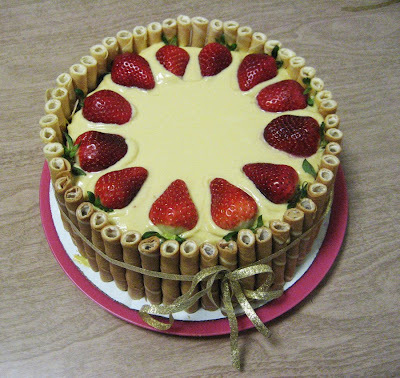 Finally, a circle of vanilla cream pirouette cookies--held together by the same sparkly gold ribbon--hides the strawberry-and-Irish-cream center from sight until the birthday boy cuts into the cake for a sweet surprise.